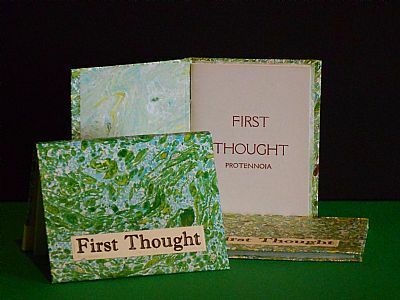 Also known as Protennoia, the First Thought is one of thirteen papyrus books found in a jar in a cave near Nag Hammadi in Egypt in 1945. It is a poem spoken in the voice of a female Divinity. Edition of 50 copies Letterpress Printed in two colours. Size 75 mm x 58 mm. 15 pages.